After a hundred years of recording, the process of making records is still mysterious to most people who listen to them. Records hold a fundamental place in the dynamics of modern musical life, but what do they represent? Are they documents? Snapshots? Artworks? Fetishes? Commodities? Conveniences? 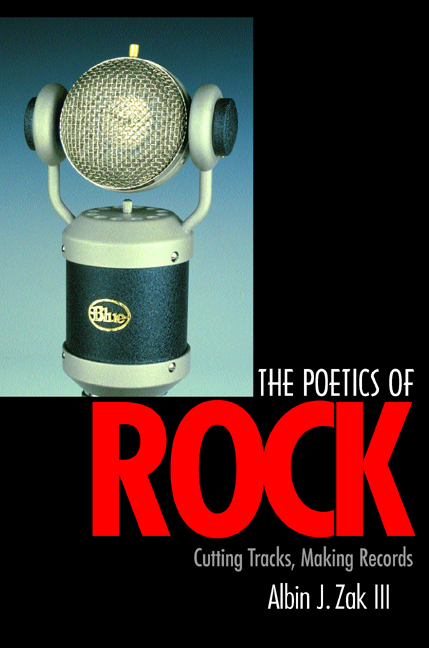 The Poetics of Rock is a fascinating exploration of recording consciousness and compositional process from the perspective of those who make records. In it, Albin Zak examines the crucial roles played by recording technologies in the construction of rock music and shows how songwriters, musicians, engineers, and producers contribute to the creative project, and how they all leave their mark on the finished work. Zak shapes an image of the compositional milieu by exploring its elements and discussing the issues and concerns faced by artists. Using their testimony to illuminate the nature of record making and of records themselves, he shows that the art of making rock records is a collaborative compositional process that includes many skills and sensibilities not traditionally associated with musical composition. Zak connects all the topics--whether technical, conceptual, aesthetic, or historical--with specific artists and recordings and illustrates them with citations from artists and with musical examples. In lively and engaging prose, The Poetics of Rock brilliantly illustrates how the musical energy from a moment of human expression translates into a musical work wrought in sound. Albin J. Zak, III is Assistant Professor of Musicology at the University of Michigan School of Music. He is also a songwriter and recordist, and editor of The Velvet Underground Companion: Four Decades of Commentary (1997).